Alex Jones Attends Facebook-Twitter Hearing, Confronts Marco Rubio And Ron Wyden! Infowars founder Alex Jones showed up to the Senate Intelligence Committee's hearings with Facebook's Sheryl Sandberg and Twitter's Jack Dorsey on Wednesday and slammed the media for supporting censorship. 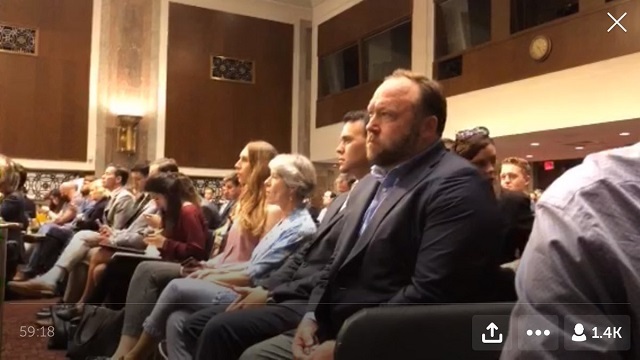 Alex Jones just walked into the Senate Intelligence Committee hearing with Sandberg and @Jack. He's missed the first hour or so but now the cameras are fixed on him and his front-row seat. Jones is streaming live from inside the chambers! Got News's Chuck Johnson is also in attendance! Marco "The Rube" Rubio even said he wants Big Tech to "crack down" on "certain users" who are "hostile actors" using "misinformation, disinformation or hate speech for the purposes of sowing discord or interfering in our internal affairs." Rubio just asked Big Tech to crack down on "hate speech"
"You guys have dehumanized me....stop violating my First Amendment in those hearings.